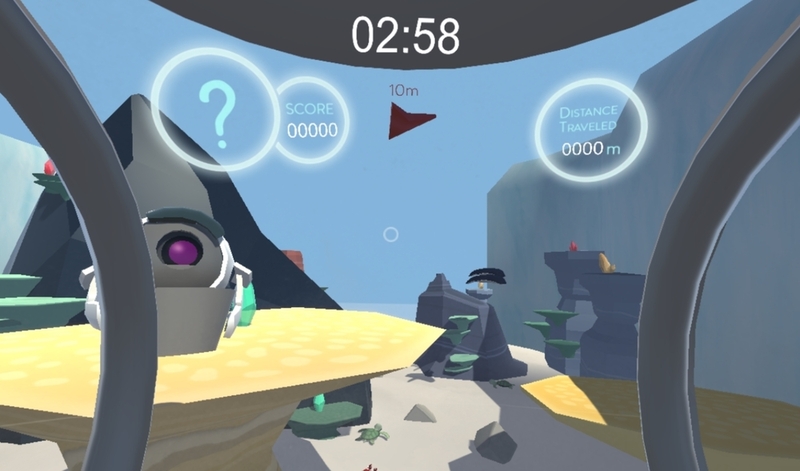 Explore the ocean floor of an alien planet alongside your trusty Briefing, Utility, Collection, & Kinetic Transport (BUCKiT) robot companion, collecting gems and other loot! Experience the sensation of flight from within a flight simulator cockpit, while navigating your pod and tractor beam within an immersive world as viewed through the Oculus Rift. Using the flight simulator cockpit and Oculus Rift as input devices, the guest is given the freedom to navigate their space pod through a beautiful landscape in VR, filled with gems to collect and animals to interact with in a timed experience. Guests can use their tractor beam to move objects around in the world, as well as launch them toward the collection unit, BUCKiT. For a less gameplay oriented experience, guests can also choose to explore, and fly through the caverns and crevices scattered throughout our world. At the end of the experience, players are shown their score and their collected items, which is then recorded on an external scoreboard for other players to try and beat. I built models, drew textures and designed the user interface in the game. Since the guest is in this space pod, I chose to create UI elements more like future style; I built part of the environment models and drew all the textures for models including the seamless moving waterfall and skybox.